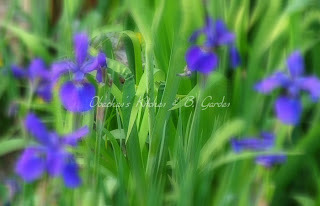 Nevertheless, many Japanese still associate iris flowers with this old custom and with the month of May. 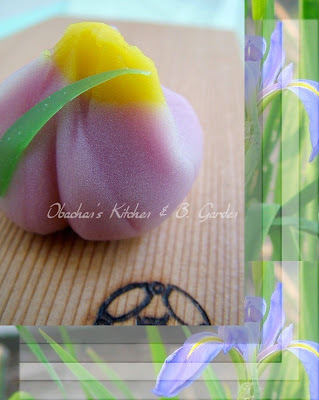 Actually, late May and early June are iris season around here, so it is no surprise to see lovely iris-shaped wagashi at most wagashi shops at this time of the year here. This is an idea which I stole from a Japanese magazine a while ago. (I forgot if it was "Orange Page" or "ESSE.") And IIRC, this was an idea by a Japanese chef named Kentaro. He is a well-known chef in Japan (partly because his mom is a popular chef) and he has written many cook books. There are some Japanese people who do not care for his recipes very much, saying that his recipes tend to be a bit too buttery, and I might as well agree with that opinion. The recipe does deserve five stars, I think.